Chris Hacker | The PHOENIX The Office for International Programs is responsible for sponsoring foreign faculty through the H-1B visa process. Following a recent change to the nation’s visa program, Loyola may have trouble hiring faculty and staff from outside the United States. H-1B visas allow international postgraduate professionals to work legally in the United States. Loyola applies for H-1B visas to bring in faculty and staff from around the globe to work at the university each year. Currently, there are 23 employees working at the university under H-1B visas. Of those, 22 are faculty, according to executive director for Loyola’s Office of International Programs Jennifer Engel. Loyola planned to add two more international professors for the upcoming fall semester, but their statuses are in jeopardy. Loyola traditionally used premium processing — a provision by which visa applicants could pay $1,225 to jump ahead in the line of H-1B applicants — to quickly complete requests for faculty and staff from abroad, according to Engel. Premium processing requires United States Citizenship and Immigration Services (USCIS) to respond to a visa application within 15 days. On April 3, USCIS temporarily suspended premium processing. USCIS will now process every visa request in the order submitted, a process which can take much longer. While USCIS caps the number of H-1Bs given out annually at 65,000, universities are exempt from that cap. Cabrera said H-1B visa premium processing filings went up 61 percent between fiscal years 2014 and 2016. Now, premium processing accounts for nearly 59 percent of H-1B filings. Nathan Graham, an immigration attorney and senior associate at Fragomen, Del Rey, Bernsen & Loewy, PLLC, who Engel said represents Loyola, said normal processing time for visas is usually four to five months. Now the processing time has slowed to at least nine to 10 months as visa requests increase. Graham provides legal advising to universities and foreign nationals considered for hire on how to navigate the visa process. After the changes, Engel said the university cannot seriously consider new foreign hires because the normal visa process would take too long. “Say we wanted to extend an offer in April or in May for an international faculty member or staff member to start in the fall — we wouldn’t be able to really do that given the timeline,” Engel said. Loyola recently sponsored two foreign professors who are now being processed for H-1B visas, according to Engel. Due to the announcement, it’s unclear if their visas will be approved in time to work at the university this coming fall, she said. “Those [professors] that are already in process are continuing to be processed accordingly,” said Engel. Engel said because of the university’s confidentiality policy in dealing with visa applicants, she couldn’t reveal the names of the two professors. If they don’t get approved in time, that means departments at the university might be scrambling to fill teaching spots in several classes or find new candidates for professor positions left vacant. Graham is working on making sure these requests get filled, but he said USCIS’s “wildly inconsistent” application of its standards when reviewing visa cases is frustrating. Paired with the suspension of premium processing, that means sometimes waiting longer before a visa denial and an attempt to resubmit a request. “You’re kind of stuck. Employers, foreign nationals [and] we as counsel are all forced to be stuck in a limbo for obviously a lot longer than we otherwise would be [with premium processing],” Graham said. Graham added the suspension of premium processing might hit universities the hardest because it interferes with the typical hiring process for foreign professors. 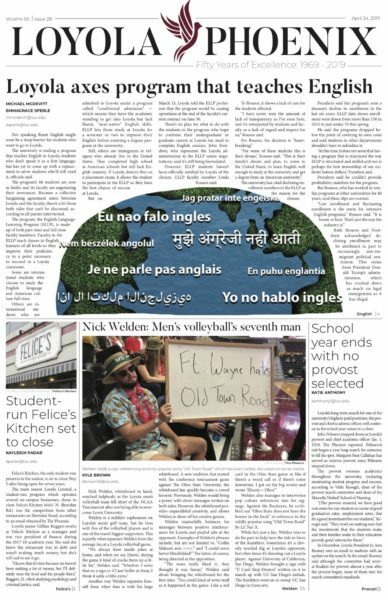 Some Loyola students said they think it’s important for students to get an international perspective and foreign professors provide that. “It does impact me as a student because I’m not able to get that international diversity,” said 21-year-old junior economics major Lukas Gilius. Ann Grogan, 18, said international professors give students a broader worldview. “I think it’s important to be educated by people who have had different upbringings than yourself,” said the first-year nursing major. Although the visa roadblocks don’t impact Engel’s department directly, she said she still feels disappointed in the suspension of premium processing.